Combine all ingredients in a medium-sized serving bowl. Toss well to coat. Cover the bowl with plastic wrap and refrigerate at least 2 hours. Serve with tortilla chips. Cook linguine pasta in boiling water according to package directions. Drain and set aside. In a medium bowl, add shrimp, lemon zest and 1 cup cilantro. Toss well to combine. Heat oil and butter in a deep skillet over medium heat. Add garlic and saute for 30 seconds. Add white wine and salt and let come to a boil. Add shrimp mixture and cook about 3 minutes, or until shrimp start to turn opaque. Add pasta to the skillet and toss well until most of the liquid is absorbed, about 1 minute. Sprinkle red pepper flakes over the pasta and toss again. Transfer shrimp and pasta mixture to a large serving bowl. Sprinkle remaining 1 cup cilantro over the top before serving. In a small bowl, combine softened butter, cilantro, lemon juice and lime juice. Stir well to combine. Cover bowl with plastic wrap and store in refrigerator until ready to use. Carefully peel back corn husks, leaving them attached. Remove the corn silk. Return the husks to their original position, covering the ears of corn. Place corn on hot grill and cook approximately 10 minutes, turning every 2 minutes. Remove from grill and let stand 5 minutes. Remove corn husks carefully as they will be hot. Spread cilantro butter over the ears of corn and season with salt. Serve immediately. To a small saucepan, add cilantro, garlic, salt, pepper, honey and lime juice and stir over medium heat. Cook about 5 minutes or until honey is thin. Remove from heat and let cool slightly. Place salmon steaks in a baking dish. Pour marinade over the salmon, making sure to coat both sides. Cover baking dish and refrigerate for 1 hour. Preheat grill for high heat and brush oil on the grill grate so the salmon doesn't stick. Place salmon steaks on hot grill. Cook for 5 minutes on each side, turning only once. Salmon should easily flake with a fork when it's done. Serve immediately. 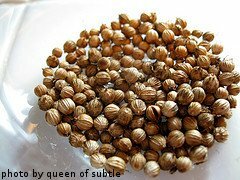 In a small bowl, mix together salt, pepper, cumin, coriander, paprika, garlic and olive oil. Stir with a fork until a paste is formed. Rub the paste on the pork chops, making sure to coat both sides. Place pork chops on hot grill and cook 6-8 minutes on each side, turning once. Cooking times will vary depending on the thickness of the chops. They are done when internal temperature reaches 160 degrees F. Serve immediately. Cook orzo in boiling water until al dente, according to package directions. Drain and cover to keep warm. Heat 2 tablespoons of olive oil in a skillet over medium heat. Add chicken and garlic. Sprinkle coriander, salt, pepper and paprika over chicken. Cook about 6 minutes, browning both sides, until chicken is done. Remove chicken from pan and let drain on paper towels. To a large serving bowl, add spinach, tomatoes, lemon Zest and juice, cilantro leaves, parsley, red onion, remaining 2 tablespoons olive oil, cooked chicken and cooked orzo. Toss well to combine. Sprinkle feta cheese over the top and serve immediately. Heat vegetable oil in a skillet over medium-high heat. Season chicken with salt, black pepper, garlic powder and paprika. Place chicken in skillet and saute until brown on both sides and cooked through, about 5 minutes. Remove chicken from skillet and set aside. To the same skillet, add peanut oil and butter. When butter is melted, add onions and saute 12-15 minutes or until very brown, stirring often. Add ginger and garlic to brown onions and saute another 2 minutes. Pour this mixture into a food processor and puree until smooth. Pour the puree into a large saucepan. Do not rinse out the food processor. Stir cinnamon, 1 teaspoon black pepper, coriander, cumin, turmeric and cayenne pepper into onion puree. Cook over medium-low heat until mixture forms a paste. 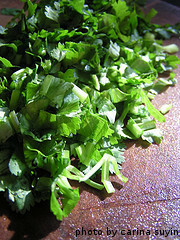 To the food processor, add tomatoes, chili pepper (remove the seeds if less spicy curry is desired) and cilantro leaves. Puree until smooth. Pour tomato puree into onion paste and whisk to combine. Again, don't rinse out the food processor. Continue cooking over medium-low heat. Slowly whisk in yogurt a little at a time. Continue whisking to avoid curdling. When yogurt is incorporated, return the entire mixture to the food processor and puree it again until the sauce is very smooth. Return the puree to the large saucepan and add water. Increase heat to high and stir well to incorporate water into the puree. Bring sauce to a rolling boil. Cover pan and let boil 4 minutes. Reduce heat. Add chicken to the sauce and simmer about 10 minutes, or until sauce is desired consistency. Serve over cooked rice or with toasted bread. We hope you enjoy these cilantro recipes as much as our family does.